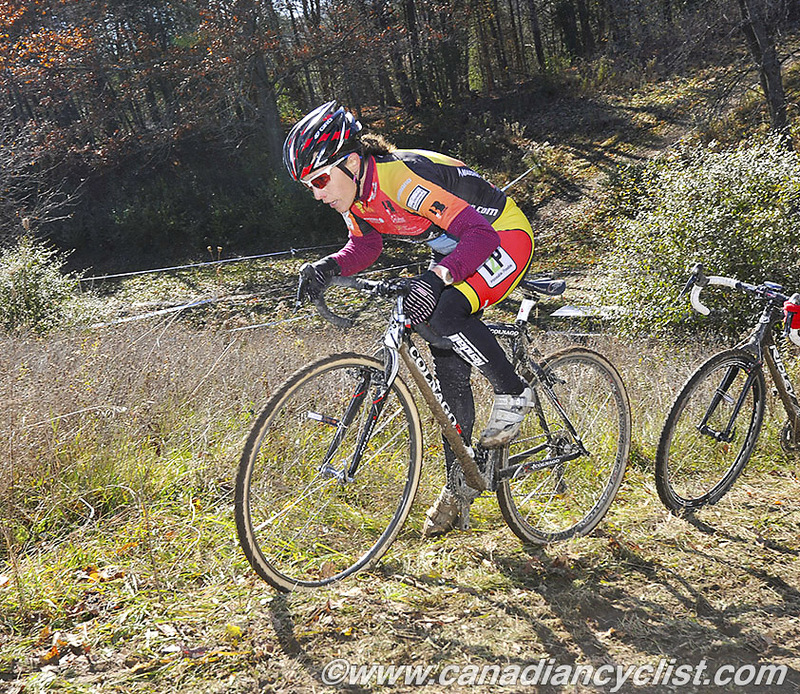 Wire-to-wire victories were the order of the day at the Ontario Cyclo-cross championships, held on Sunday (November 3rd) under sunny but crisp conditions at Albion Hills Conservation Area, approximately 30 minutes north of Toronto airport. 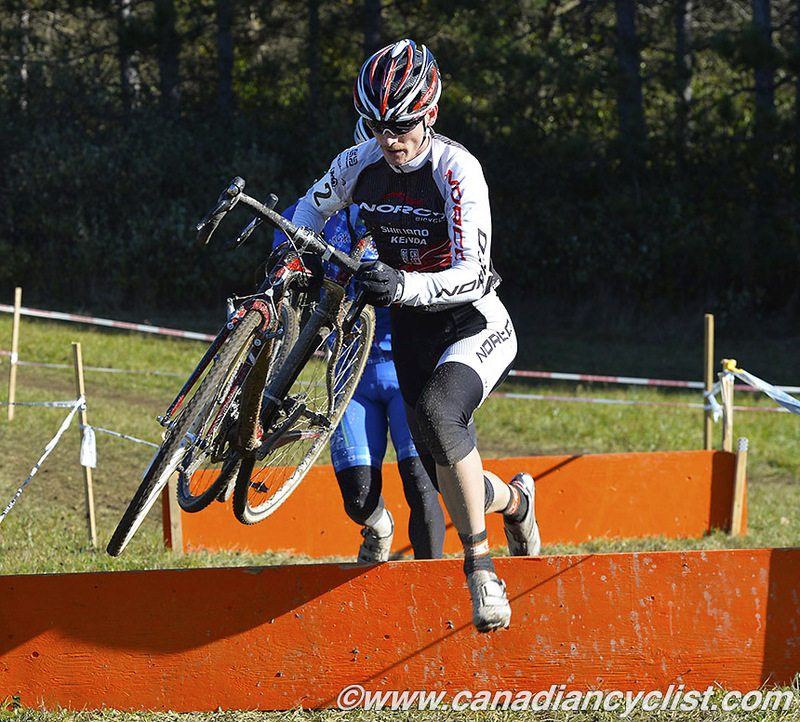 Defending champion Julie Lafrenière (Ride With Rendall) took the win in the Elite Women's category, while Andrew L'Esperance (Norco Factory Team), who hails from Halifax, Nova Scotia, claimed victory in the Elite Men's bracket. 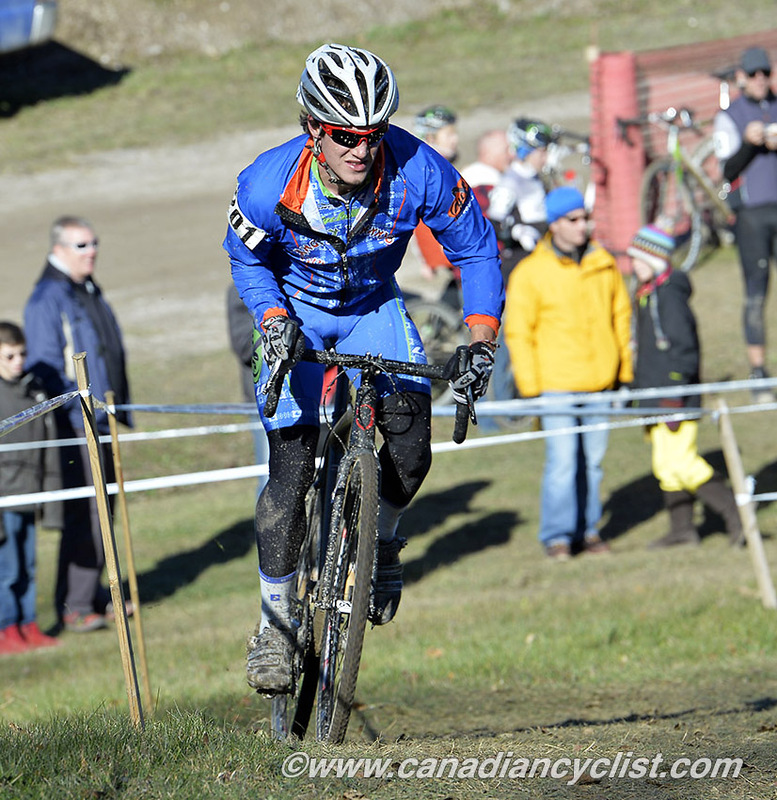 Andrew Watson finished second overall to his teammate L'Esperance, but was awarded the provincial champion's jersey by virtue of being the top Ontario resident. 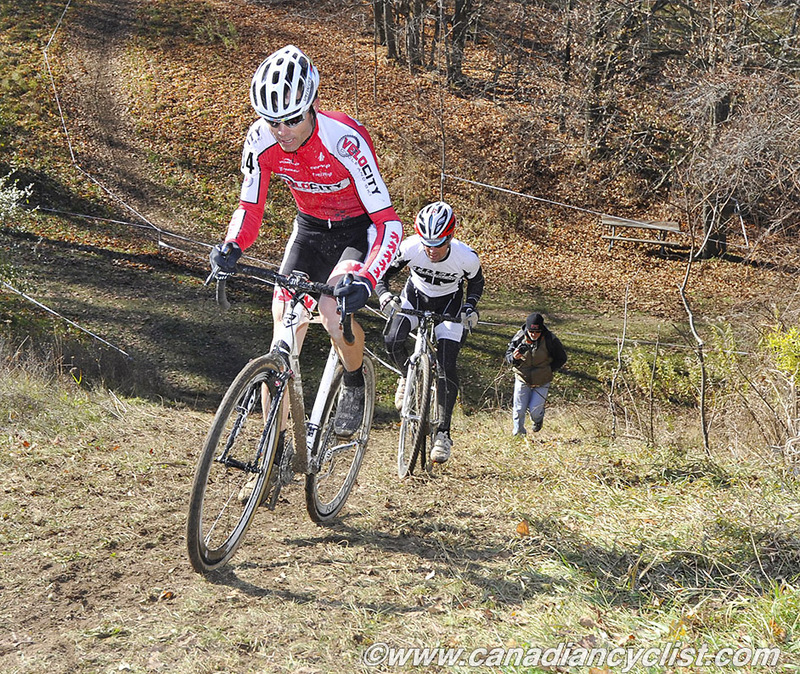 Designed by Sean Ruppell and John Bates, the course at Albion Hills featured a number of punchy climbs, a short sandy beach, a spiral of death, and a singletrack-like wooded section with a couple of log barriers. Due to ongoing construction within the park, the opening straightaway contained a number of large puddles as well as some rough and rutted patches of uneven ground. Below freezing temperatures the night before and in the morning resulted in frozen over puddles and bumpy ruts, but as the sun warmed the ground the surface layer melted, making sections of the straightaway a sloppy mess. Lafrenière got off the line cleanly and immediately moved to the front. Pre-race contender Jamie Gilgen (Blacksmith Cycle) didn't fare quite as well, falling behind in the early going. "I was nervous about crashing in those big ruts," she explained. "I thought it would be better to play it safe. But sometimes when you play it safe you go a bit wonky, and I went a bit wonky." The tricky start, combined with Lafrenière's opening speed, saw the field quickly strung out into a long line. Gilgen was able to regroup, catching and passing Laura Bietola (RealDeal/Gears pb Fieldgate) and Haley Smith (Norco Factory Team) to move into second place before the end of lap one. Lafrenière, however, would not be caught, crossing the line just over a minute ahead of Gilgen, with Smith taking third, Emily Flynn (West of Québec Wheelers) fourth, and Antje Thamm (Invita - FCV) fifth. "It was not easy," said Lafrenière of her win. "It was hard." 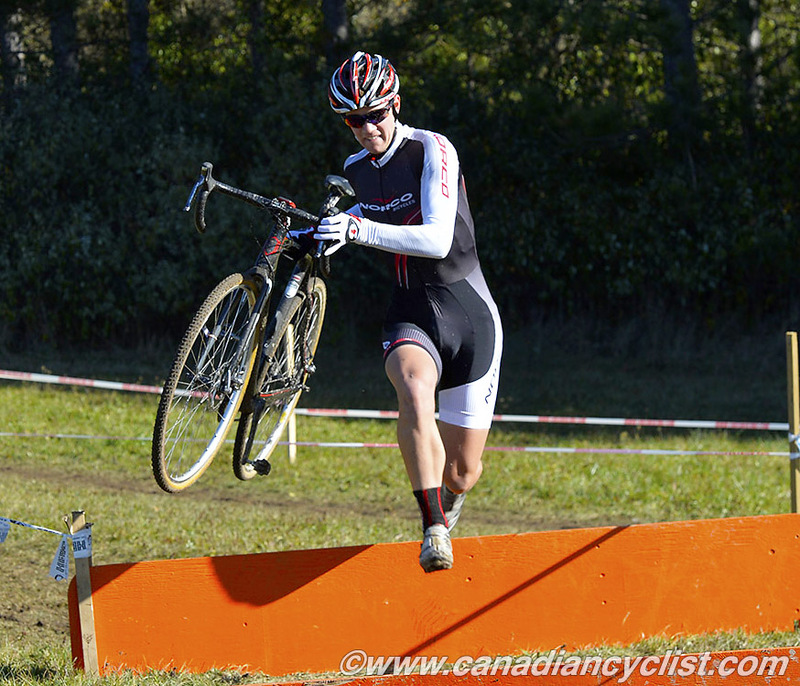 Living and racing in the Ottawa area, Lafrenière was unfamiliar with most of her opponents and kept the pressure on, lest anyone should come back to her. Her lap times reflected as much, varying only by 20 seconds. "This was a pretty solid race," said Gilgen. "It was really consistent power output. Last weekend (in Barrie) was more tactical. This weekend just seemed like raw powerfest, and it looks like Julie had more today, but that's racing." Although Smith doesn't have a lot of 'Cross experience, she considers her mountain bike skills to be a definite asset. "I didn't expect to do this well, but it's really fun and I find that it's similar to mountain biking. I wanted to see if I could stick with the leading women for a bit, but other than that I just wanted to race my bike and have fun." Just as with the women's race, action in the opening straightaway played a role in the men's event. L'Esperance smoothly moved into the lead, but Watson ran into trouble within the first 100 metres. 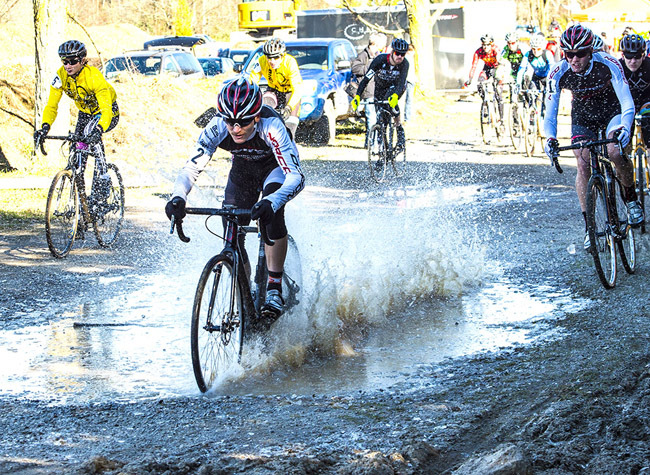 "Off the start I went in a straight line, just trying to hold my line, and I went through a puddle which I didn't know was, like, a foot deep, so my bars slipped down. I was on my hoods so they slipped forward, so it actually made me almost not make turn one." The confusion led to an immediate gap for L'Esperance., with Under-23 rider Peter Disera (CSAJCC p/b Norco LG) and Marco Li (Beaches Cycling Club) in pursuit. Just behind was a group containing Alex Gibson (EsteemTraining.com), Jacques Cormier (Bikes on Wheels), Jacob McLelland (AWI Racing), and Watson, whose mechanical woes had only compounded. After making it to the pits on the opening lap, Watson discovered that the stem on his spare bike was turned, requiring a second switch. Upon changing back to his original steed, he tripped while running out of the pit, bending his derailleur hanger, which threw off the shifting. After a third change, back onto his spare bike, he was good to go. L'Esperance, meanwhile, was riding strongly, holding a lead of more than 20 seconds over Disera and Li. "After I went for that first lap $100 prime I got a pretty good gap there and just sort of rode my own race. I was able to go hard on the sections that I wanted to and easy on the other ones and ride my own race. I wasn't expecting to hold that gap the whole race, just because Andrew's so strong." Watson certainly was strong, ticking off a succession of fast laps as he made his way through the field, which had broken up as the race progressed. Disera had managed to drop Li, but, once caught by Watson, the tables were turned. With a teammate up ahead, Watson wasn't about to tow Disera to the front, so he bided his time, waiting for an opportunity to attack. "I had to make sure I didn't jeopardize the win for the team, at least." "He was very, very good in the technical stuff," said Disera of Watson. "He kept gapping me and I was wasting energy trying to catch back on. Through the hilly section I was getting gassed and he decided to go in the spiral and I just couldn't close the gap after that." Up ahead, L'Esperance maintained his pace to take a well-deserved win ahead of Watson, with Disera holding third, ahead of Li in fourth and McLelland in fifth. 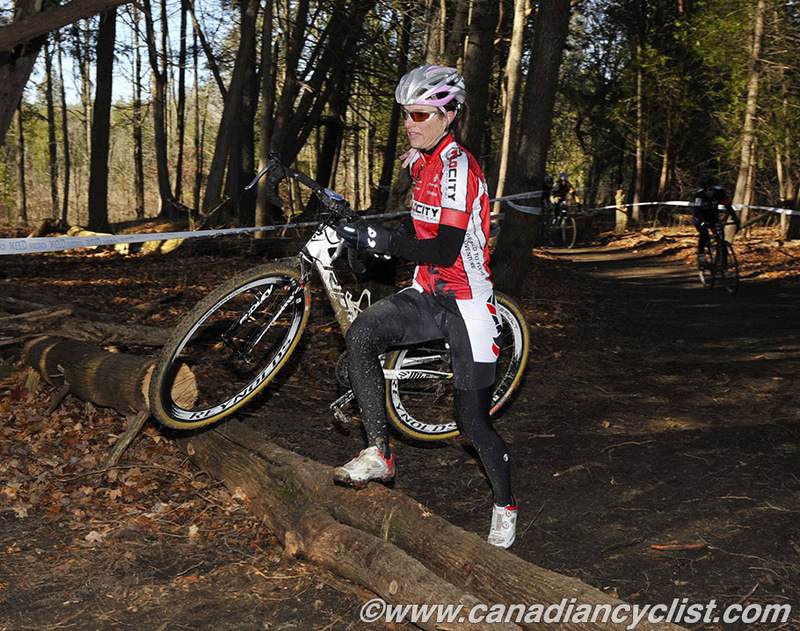 - Disera, who ended up being the U23 provincial champion, hadn't surveyed the course prior to the race. "I was just trying to follow people and figure out what lines were happening. While this was happening L'Espy was getting away nicely." 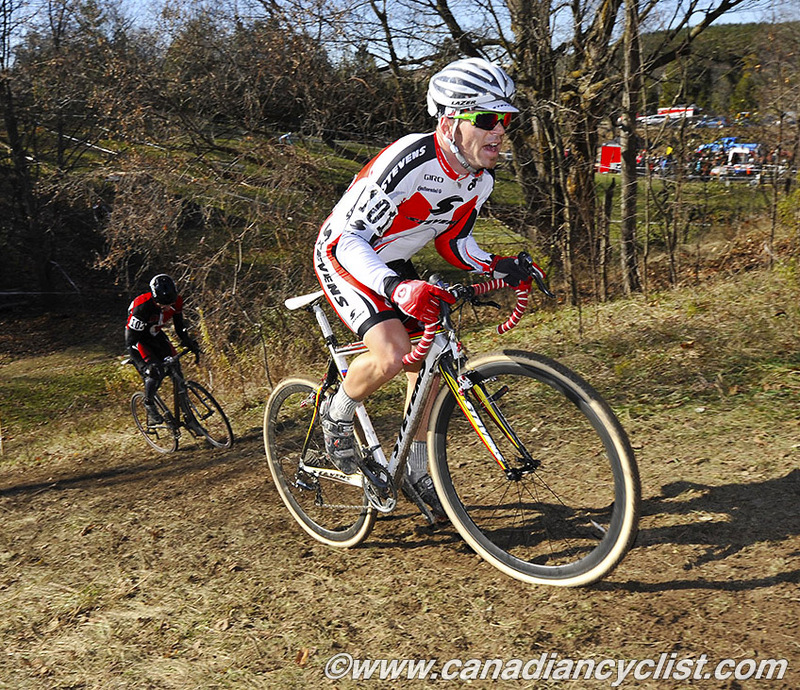 - There was confusion for organizers on how to treat Disera's third place among the Elite Men. The U23s started with the Elites, so Disera finished third overall. He received the provincial championship jersey for U23, but not the third place money in the race, just the first place U23 prize. If it had been a national level event he would have received the third place prize as well. - Gilgen now has a silver medal to go with last year's bronze. Gold next year? "I hope so." - The Holmgren family was three for three, with Gunnar (U17 Male), Lisa (Master Female) and Rob (Master B Male) all taking home provincial champion's jerseys. All are members of Velocity Cycle & Ski, and, according to Rob, all had eggs, cheese and Nutella for breakfast. 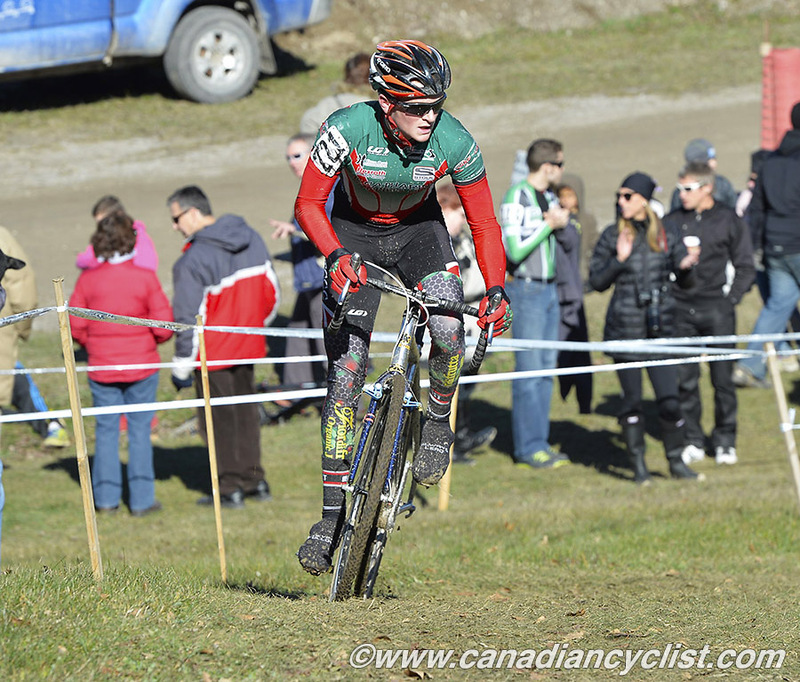 - Jon Barnes (Trek Canada), second in Master B Male, feels that the new practice of having the Master 1 men's field start with the Elite men's field at regular O-Cup races has been beneficial. "I'm way faster than last year. It makes the group better." Referring to himself and Holmgren, Barnes commented that "We're two 40 year-old guys racing with Peter Disera. When you're racing with guys like that it only makes you better." - There was some confusion surrounding the finish of the Master A men's race. Peter Mogg (Steven's Racing p/b The Cyclery) outsprinted Tim Marshall (Morning Glory CC) to take what he thought was the win, only to be instructed to complete an extra lap. "Tim actually waited for me after we came through when we sprinted with two to go," explained Mogg. "He's a good competitor and if he's going to win he wants to win fair and square." As luck would have it, Marshall dropped his chain while traversing the barriers near the end of the last lap, handing victory to Mogg, again. - Li commented that part of the course favoured those with a mountain bike background. "Through that singletrack I couldn't hop those logs as well as the mountain bikers. It was to their advantage in there. Down the straights I was catching them but you can only make up so many gaps every lap." The Toronto resident joined the ranks of fatherhood eight weeks ago. "I've been lucky enough to have my wife let me race. I'm looking forward to next year. He'll be a bit older and maybe I'll get to ride a bit more. I've pretty much just been riding to work and back and racing on the weekends."